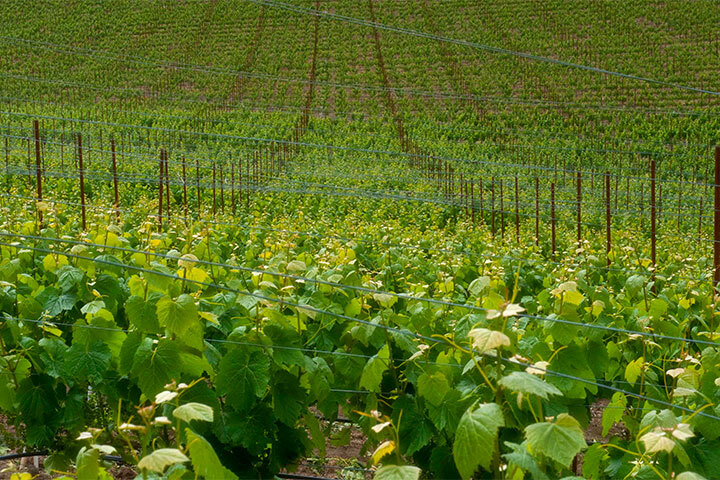 Sonoma County is one of the most diverse wine growing regions in the world. As with most of California, our climate is influenced by the distance and exposure to the cold Pacific Ocean — areas near the water are cool, areas inland are warm. Sonoma also boasts incredibly complex soils ranging from volcanic along the Mayacamas Mountains to marine-based in all of the coastal locales. The patchwork of Sonoma’s climate, soils, and topography influence where and how its vines are planted. When developing vineyards or sourcing fruit, we make sure the variety is perfectly matched to its region. While every individual site has its own distinct terroir, there are some overarching attributes we associate with each of Sonoma’s AVAs. Roth's Vineyards are located in Sonoma's prime AVAs. in two of Sonoma's prime AVAs. A narrow, warm and diverse appellation, Alexander Valley is located at the northern end of Sonoma County. Hot midday temperatures give way to maritime conditions in the evenings and mornings when just enough fog makes its way up Russian River Valley into Alexander Valley. This balance of warm and cool benefits the Bordeaux varieties for which Alexander Valley is best known. The Sonoma Coast AVA is the largest in Sonoma County and California’s most extreme region, climate-wise. Its boundaries run along the Pacific Coast from the Mendocino County line in the north down to San Pablo Bay and Marin County in the south. It encompasses more than 500,000 acres, with only about 7,000 acres presently under vine. With daytime highs typically in the low 70s and nighttime temperatures that fall to the 40s during the growing season, the Sonoma Coast is the coolest in the state, barely allowing grapes to ripen. These cool conditions are caused by the fog and wind that breeze through the Petaluma Gap, and lengthen the region’s growing season. A typical harvest sees a majority of the region’s grapes harvested in mid-October to November — quite a contrast to warmer regions, where harvest usually begins in August.